Camden is by far my favorite area of London. It is edgy, young and stocked with pubs, music venues (such as the well-known Roundhouse), shops and restaurants. On Sundays, or market days, stalls flood the streets and the designated market area. Although the stalls may get repetitive (albeit I was there for a good four hours), one can find cheap jewelry, dresses and quirky things like angel wings, hand-made wooden pipes and studded army helmets. I recommend getting there by ten, the stalls will just be opening and you can shop without competition. The massive crowd arrives by twelve in the afternoon. It is an eclectic bunch. In one second I saw a green mohawk and the next an overweight champion tourist adorned with a massive camera and guidebook. Unlike the Portobello market, Camden was filled with items I had a desire to purchase. Also the range of the market is larger than that of Portobello. 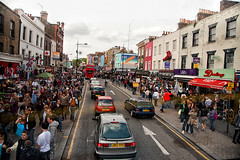 Camden’s internationally renowned market seems to consume the entire area. If you are relocating to London and looking for something different and less “mainstream” make sure to explore Camden.